Anti-aging skin care serum specifically targeting wrinkles, puffiness and dark circles. eyes EFFECT® : global anti-aging skincare for the eye contour area. Prevents and minimizes all visible signs of skin aging and fatigue. Lifting effect visible after 1 hour, anti-wrinkle after 1 hour, anti-wrinkle properties effective for 24 hours. Minimizes wrinkles and fine lines in the eye contour area, gradually lightens dark circles and eliminates puffiness. Created for oily, combination, normal and dry skin, suitable for even the most sensitive skin. Apply daily to the eye contour, day and / or night after your face care routine. This smooth cream, rich in active ingredients, is quickly absorbed. Its fragrance evokes a floral bouquet with green notes, which disappears after applying. It creates an excellent makeup base. Using light circular movements, apply eyes EFFECT® daily along the eye contour, on clean and dry skin, (see diagram below). To treat rosacea, apply to the cheekbones also. 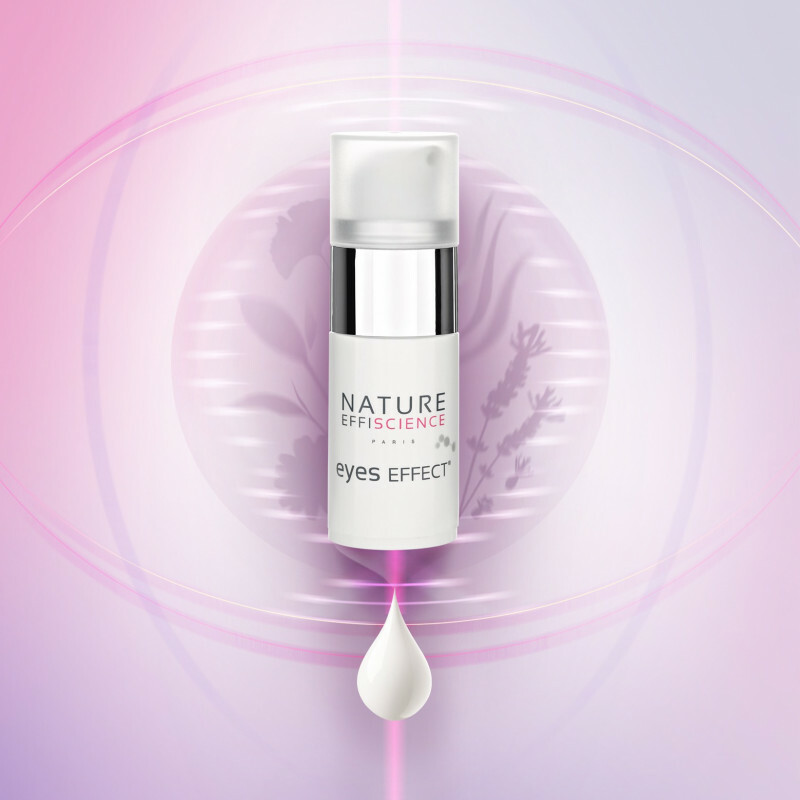 From 30 years of age: a single application per day of the eyes EFFECT® product is enough to correct and prevent from the first age-related imperfections. If you have dark circles or signs of fatigue, start with 2 applications per day the first week. From 45 years of age: Apply the eyes EFFECT® skin care around the eye day and night. Intense moisturizing action: You can use the eyes EFFECT® product combined with the booster EFFECT® serum to obtain deeper moisturizing action. Thanks to the macadamia oil, aloe vera extract and hyaluronic acid, the fine skin around your eye is well hydrated for long-lasting comfort. Apply a small quantity around the eye area with a gentle, patting motion. Start with the lower eyelid, from the inner corner moving towards the outer corner of the eye. Next, start from the inner corner of the upper eyelid, moving towards the outer corner. The metod below is not recommended for pregnant women due to the pressing motions. Apply pressure on the eyebrow arch and on the top of your cheekbones, as shown in the picture. Repeat twice. Make-up may be applied directly after a skincare. No fixing agent needed. One hour after the application, the fine skin around your eyes is more balanced, well hydrated, and puffiness is reduced. The combination of white tea, Ginkgo Biloba and Chamomile has fortifying properties, toning and soothing your skin. Gives an illuminated, radiant and stress free look. Your skin is supple, unified, smoother and your features more relaxed. With age, stress and fatigue, wrinkles and dark circles appear, making skin look tired. 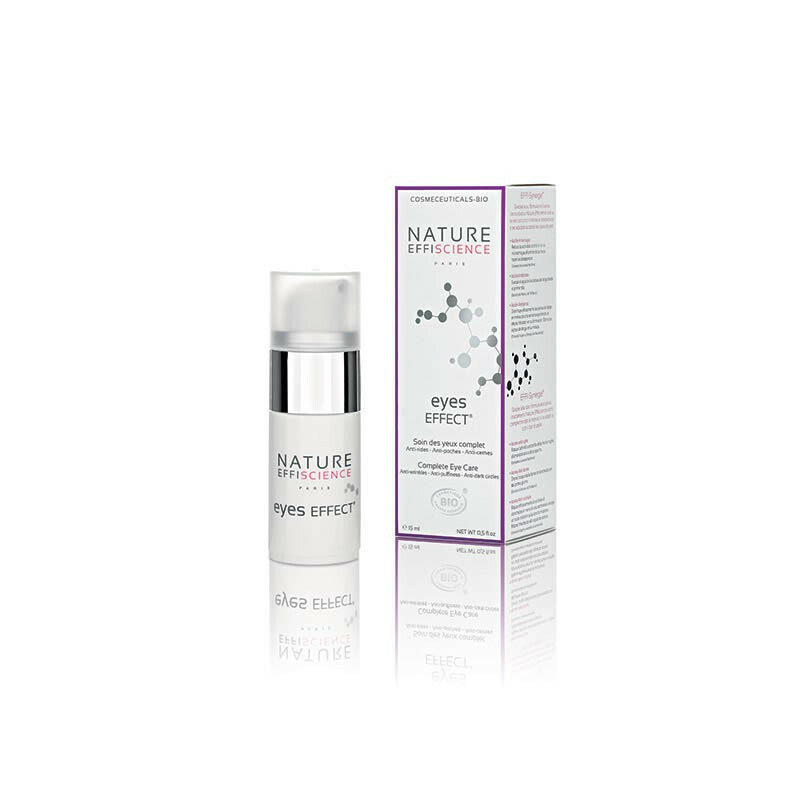 The eyes EFFECT® product revitalizes the eyes, reducing wrinkles, puffiness and dark circles. A concentrate of micro-green seaweed, samphire and butterfly lavender extracts provides vasoconstrictive, moisturizing and detoxifying properties. Gradually lightens the color of dark circles. A global anti-aging and anti-fatigue skin care product targeting the eye area, able to reduce both wrinkles and dark circles thanks to deep hydration. Eyes EFFECT® is the indispensable eye contour skin care product for anyone over age 25. Your gaze recovers and maintains its radiance. The formula is 99% active. This skin care product has been tested under dermatological control with no visible skin reactions. eyes EFFECT® contains no parabens, phtalates, mineral oils, monoethanolamine (MEA), diethanolamine (DEA), triethanolamine, silicone and animal ingredients. 84% of the formula are prodcuts from organic agriculture. Its concentration in organic ingredients is 8 times higher than the Ecocert requirement for organic certification. Our product is ethical, each ingredient and the finished product are not tested on animals. Anti-wrinkle product with a lifting effect. Relaxing your skin in 2 hours and for 24 hours. Reducing deepth and the number of wrinkles. Visibly minimizing dark circles - vasoconstrictive action. Improving fairness of the eye contours. Improving firmness - restructuring action. Increasing and tailored reprogramming the hydratation process - high rehydrating power. Shea butter: Moisturizing, preventing cutaneous aging. Macadamia oil: Anti-aging, regulating the circulatory system. Calming / Moisturizing / Anti-redness.